Beta is something they work constantly on. They polish things change things in terms of interface, dialogues and so on. Beta is something you should constantly feedback about balance and through their changes. That will normally take many month if they do it for real. Wasteland 2 for example had a Beta, Divinity had a Alpha and Beta and there was a constantly change in these ones. If you give people the beta 2-3 month before release that means 1-2 month before everything should be finished than you will not get the needed feedback. With all due respect to inXile, the "beta" they released wasn't a beta. It wasn't even remotely feature complete, and has gone through dramatic changes since. I guess you thought you'd be a big part of the design process for PoE? Other than those backers at tiers including items, that was never how this project was pitched in my recollection. The blond ladies eye seems a little off somehow, askew or misplaced, maybe that's just my perspective. Edit: The lady isn't a demonstration of a Fighter is she? One would think that their role as the punchbag would leave any Fighter horribly scarred and rather forbidding looking, as well as carrying a lot more muscle to aid in their armour bearing. Edited by Nonek, 25 June 2014 - 09:47 AM. Thank you for the class details and the artwork. Just a quick question: can the Fighter's Unbroken ability be automatically triggered when Stamina reaches 0? I.e. is it set to active beforehand? No, it's manually activated when the player chooses. Depending on the circumstances, you may not want the fighter to immediately stand back up after going down. Can the barbarian's carnage-type attacks damage nearby allies? Normally I wouldn't post about this, but I want the talk about video footage to stop in this thread. There are already three other threads that are discussing this issue and I don't want this thread to be taken over by the same discussion. If you would like to talk about this issue please go to those threads or start a new thread about that topic. This thread is going to be reserved for discussing the class update, not Obsidian's marketing plan. Mmmmh, love what I'm reading about the Barbarian here. Question: The Death Godlike supposedly does increased damage as his enemies health drops, now would this ability apply to the damage dealt to the extra attacks made from carnage or do these attacks only deal base damage? PS: I completely understand why OE don't want the E3 video or any video at this stage of development to be released. As we know some animations are still choppy and VFX are still at an early stage. Any video realeased now would be circulated by the gaming press and now that the game is supposed to be in beta i can already imagine the Youtube comments deriding the "****ty graphics". Better to wait some more then to muddy some peoples first impression. Yes, all attacks, though Carnage attacks are reduced damage to begin with. IIRC, even areas of effect can cause crit damage, so let's say the party gets hit by a huge fireball, will the Critical Defense ability still absorb crit damage, or is it just a melee damage-specific ability? Boox: I agree! The more I hear about these classes, I just know that I gotta play them all! Both the portrait with the lady fighter and that barbarian Amauan (courtesy of Polina) are fantastic creations! Yum!! Edited by IndiraLightfoot, 25 June 2014 - 09:57 AM. How does Carnage work animation wise? Is it a sweeping sort of attack animation? I suppose you don't see the barbarian, individually attack each enemy. Hypothetically, how many enemies can be hit by carnage at the same time? Can the successful attacks interrupt enemy actions? A very nice update. I like all the class info we have got so far. I think you are on the right track with all the classes. So much in fact, it is hard to chose which class to start with. At first I was going with paladin, but since Pallegina is paladin, I will pick something else. It would be great to know the classes of all the joinable NPCs before the game is released. I would like to pick a class that isn't covered by the joinable NPCs. And the portrait is just awesome. 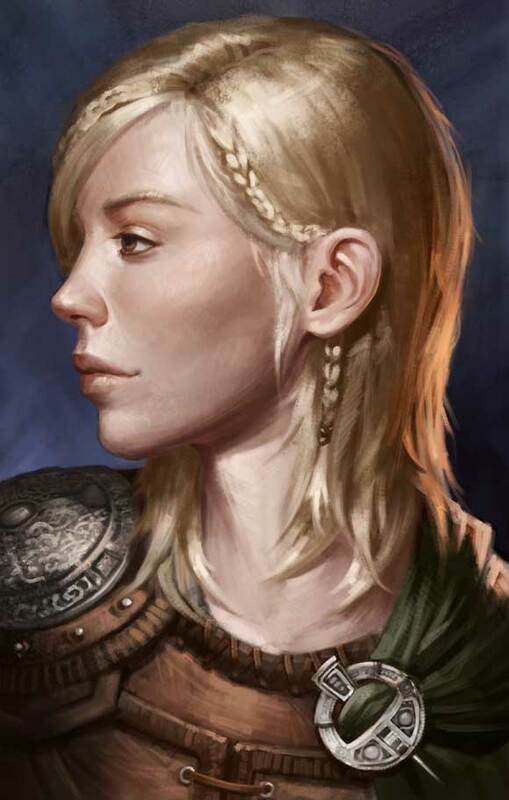 Is it a portrait of a NPC or a portrait we can chose for our PC? When Carnage "hits" enemies that weren't the main target, will there be an animation or something that plays on the Barbarian's weapon? Something like what you see from Axe in Dota 2 would be cool, even if it's just an arc attack with some blur or ghosts of the weapon. Love the update. I have never seen the reason to play a barbarian in the IE games, but the wild sprint in particular seems like an amazing tool. Gotta kill those mages fast! Great job as always! Btw is the portrait a backer or npc? Yes, Critical Defense would still apply. Carnage doesn't use special animations, just the standard attacks. It would be too expensive to animate special Carnage variants for all weapon types. The number of enemies that can be affected by Carnage depends on how close together they are and how high the barbarian's Int is. Carnage hits can cause Interrupts, yes. However, because barbarians have a lower base Accuracy than other melee classes, and Interrupt chance is influenced by Grazes and Crits, they will tend to cause Interrupts less often per hit compared to a fighter, rogue, or paladin with equivalent gear/attributes/level. Are there situations where Carnage won't activate at all? Like, say, if the barbarian's int is low enough? Is it just me or does that portrait seem a bit inconsistent with the other ones? Polina has a lot bolder outlining and sort of a "pencilly" look to some parts, Kaz has more of a painterly look. The new one has really soft outlining and is kind of "blurry" in the hair and the armor/cape (although that might partly be the jpeg compression). Looks like a different artist, although the darker lines on the cape and chin look a bit like Polina's "style". Edited by Sensuki, 25 June 2014 - 10:21 AM. Hm, tbh I'm neither interested in fighters nor in barbarians. IIRC I didn't have any of them in my favorite BG2 party. But maybe I have to in PoE since classes seem to be even more specialised than in D&D. Thanks for the update but I'm still waiting for that gameplay footage. Edited by LordCrash, 25 June 2014 - 10:21 AM. Fantastic update! One thing i thought that is brilliant and was surprised to see in my home games was the barbarians health being disabled from seeing when in rage. That is gonna be awesome lol. I love seeing that both can fill the job of the "tank" of a party but will noticeable differences. One will be the "rock" thats dependable and likely to survive and one is a bonfire that is more likely to engulf and burn the enemies to a cinder before being snuffed out. Great tactics already in my head, if one encounter needs be ran like a marathon to finish u woukd go for the fighter. If an encounter is a burst damage before u are burst damaged down, u would go with the barbarian. Man cannot wait to play the game, i am feigning for this lol. Keep doing what ur doing and remember, we know these updates and whatnot are candy for us backers that u dont have to do or are under no moral oigation to do so. Most backers know when tbey gave u money the only thing u are required to give us is a great game. Everything else u have been doing is just sweets u didnt have to give us. Thank you for the updates and all the stuff u have shown so far. Attributes are purely additive, so you can't get a 0/negative area, but you could certainly have circumstances where the same group of enemies could be Carnage'd by an 18 Int barbarian but not by a 6 Int barbarian.